Kirk Stewart’s new book “Living Suspended Lives: A Dark Journey” is a poignant book about Jack’s reunion with his wife after an absence of twelve years and thirteen days. Recent release “Living Suspended Lives: A Dark Journey” from Page Publishing author Kirk Stewart is a gripping book about the heartbreaking yet triumphant story of Jack and Kara Phillips as a husband and wife who had pled not guilty, had been convicted at trial and sentenced to 262 months and 168 months in federal prison. The author details their dark journey and ultimate triumphant reunion. 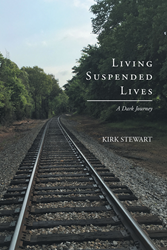 Kirk Stewart, a retired school teacher and a licensed minister of the Gospel, has completed his new book “Living Suspended Lives: A Dark Journey”: an absorbing work about the reunion of a husband sentenced for 262 months in prison and a wife sentenced for 168 months. Author Stewart tells how much Jack tries to contact his wife despite the difficulty of being in prison: “In reading the Bureau of Prison policy, I found that spouses and immediate family members should be able to write directly to one another. We had been sending letters to Paul, and he would put them in envelopes and address them and mail them to each of us from his house with his return address on the envelope. The catch was we had to get permission. I asked my counselor, Mr. Wren, about it. He called me in a week later and gave me a permission letter to complete. Kara had to do the same thing at her institution. In just a few days, we had permission to write directly to each other. I had continued the practice of writing letters to Kara seven days a week. Published by New York City-based Page Publishing, Kirk Stewart’s story is the continuation of the first book of the “Trouble at Our Door “series. Stewart’s moving storytelling also includes how expensive being subjected to trial and paying for appeal could be, thus adding burden to family members. Readers who wish to experience this insightful work can purchase“Living Suspended Lives: A Dark Journey” at bookstores everywhere, or online at the Apple iTunes store, Amazon, Google Play, or Barnes and Noble.